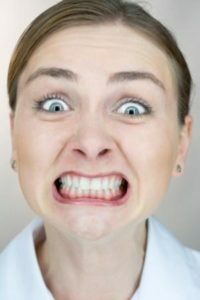 It is perfectly normal to grind or clench your teeth every so often, perhaps when dealing with situations that are particularly stressful or frustrating. Occasional teeth grinding or clenching will not cause any lasting damage, but it is a different story when teeth grinding becomes a regular habit. The correct medical term for clenching and grinding your teeth is bruxism (BRUK-siz-um). How many people have bruxism? What are the harmful effects of teeth grinding? What are the symptoms of teeth grinding and clenching? 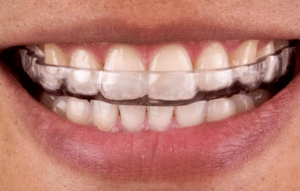 What is the treatment for bruxism? Bruxism is a condition that causes you to grind or clench your teeth. Although bruxism can occur during the day, this habit is generally nocturnal and most people are unaware they clench and grind. Bruxism is often regarded as being a sleep disorder and people who are affected by it are more likely to have other sleep disorders including sleep apnea. This is a condition that causes frequent pauses in breathing and which can negatively affect general health. People with mild bruxism may not require treatment, but more severe cases can cause significant damage to teeth and gums, possibly even resulting in tooth loss. Bruxism can also lead to jaw disorders and it may cause chronic headaches that do not respond to conventional treatment. Although easily diagnosed by a dentist, most people are unaware they have bruxism until they develop unpleasant symptoms and complications. It’s useful to know how this condition develops, the signs to be aware of and when to seek professional dental care. A study carried out in 2010 estimated around 20% of the population have what’s called awake bruxism, while 8% to 16% of the population will clench and grind their teeth during sleep. Tooth grinding while awake is generally related to work pressure or other forms of life stresses and tends to occur mainly amongst females. There is no real gender difference for sleep bruxism, but these figures don’t indicate the potential severity of this condition. In some people, it may not cause significant damage to their teeth, while others will clench and grind their teeth so hard that their teeth become completely worn down and they may eventually require full mouth reconstruction. The frequency of bruxism can also vary according to age as it’s estimated around 15% of children will grind their teeth, whereas in the elderly this figure drops to just 3% of the population. Mild teeth grinding may not cause any significant damage to teeth, particularly if it is caused by temporary stress and is not a regular habit. The main concern about bruxism is the cumulative effect of teeth grinding, particularly if this habit remains undetected for years. The average person will lose just 0.3 mm of tooth enamel every 10 years, but in comparison, someone with bruxism can lose 0.2 mm in as little as two years. Continually clenching the jaws in the same position can greatly affect the jaw muscles. 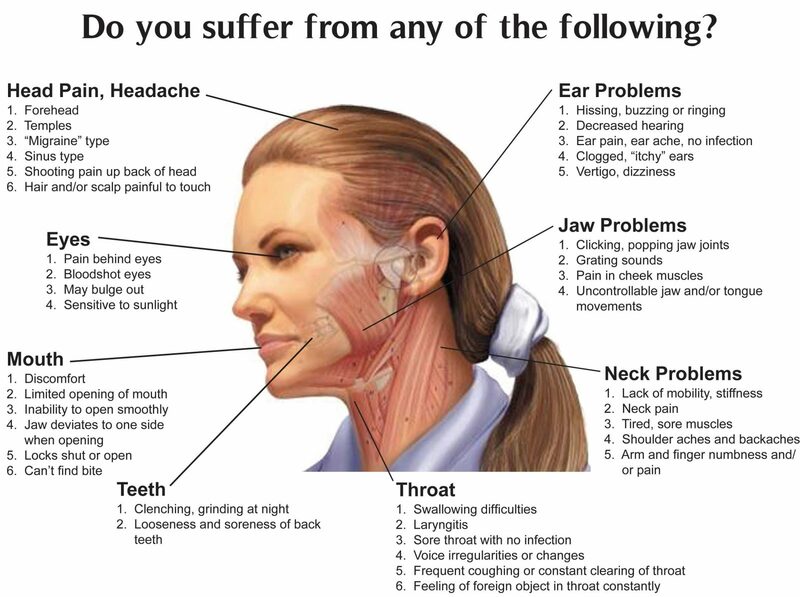 They are more likely to become sore and tired from overuse and people who clench their teeth and jaws can often develop chronic headaches due to the increased tension in their jaw. Bruxism is largely a nocturnal habit and has been linked with sleep apnea in a number of studies. Sleep apnea is a potentially serious condition where breathing is interrupted, often hundreds of times a night. Pauses in breath can last for several seconds and are due to the muscles responsible for holding open the airway relaxing during sleep, causing an obstruction. Sufferers often restart breathing with a loud gasp which will only partially awaken them. As a result, they will frequently wake up feeling extremely tired, even though they think they have had a complete night’s sleep. Research carried out in the US found that as many as a quarter of patients with obstructive sleep apnea, the most common form of this sleep disorder, also suffer from nighttime bruxism. Bruxism is closely associated with TMJ disorders. TMJ stands for the temporomandibular joint which is the joint connecting your skull to your jawbone. Any problems with this jaw joint can be very painful. It can often be difficult to determine the exact cause of TMJ disorders, but women aged between 20 and 40 are more at risk, even though they are not overly represented in the number of people suffering from bruxism. Bruxism can be caused by a wide variety of reasons that may be physical or psychological. Children will often clench or grind their teeth during sleep but will later outgrow the habit, while adults may develop bruxism in middle age. Bruxism can sometimes be due to an irregular or abnormal bite, or perhaps because of an ill-fitting denture or other dental restoration. It may also be due to tooth loss and where the remaining natural teeth have begun to drift out of position, affecting the way they bite together. Habits such as chewing gum, or chewing the ends of pencils or pens may also exacerbate clenching and grinding and people with bruxism are often advised to be mindful of these habits and to try and avoid them as much as possible. However, one of the main causes of bruxism is thought to be stress and anxiety. Often when people are under excessive stress they may develop repetitive or nervous habits that help relieve some of the tension. For example, some people may bite their nails while others will fiddle with their hair. Unfortunately, bruxism is another coping mechanism for excessive stress and it’s estimated that nearly three-quarters of cases of bruxism are triggered by anxiety or stress. Anybody who is under stress is more likely to hunch their shoulders and to clench their teeth, as it is part of the natural ‘fight or flight’ mechanism that is present in everybody. 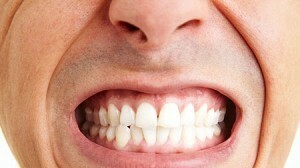 People who have good strategies for coping with stress, such as using exercise or relaxation techniques are less likely to develop bruxism. Some people’s personalities may put them at additional risk of developing bruxism. People with attention deficit hyperactivity disorder (ADHD) have a higher risk of developing bruxism compared to the rest of the population. This is because a hyperactive personality can release an excess of nervous energy that is expressed through teeth grinding and clenching. Additionally, people with ADHD can experience greater levels of stress, putting them more at risk of developing this habit. Quite often children will simply like the sensation of clenching and grinding which is why it turns into a habit. At this age, many children will still have their baby teeth and it’s quite possible their teeth might not meet together correctly. Sometimes orthodontic treatment is required and this may also help to address any additional problems with sleep apnea and mouth breathing. Most children will outgrow bruxism by the time their adult teeth come through, so often treatment might not be necessary. Tooth pain is one of the most common symptoms, as continual grinding and clenching can create chips, cracks or fractures in the teeth, which in turn can lead to tooth sensitivity. This may be particularly noticeable when eating or drinking anything hot or cold. Abnormal wear spots on teeth are often an indication of teeth grinding or clenching. These are spots where the tooth enamel has been completely worn through, exposing the dentin underneath. Dentin contains the natural color of the tooth and it can often look darker. This also increases the risk of tooth decay as dentin is softer and more easily eroded than tooth enamel. Some people will wake up with painful jaws or the pain may be constant. Eating tough foods that require substantial chewing can exacerbate the discomfort. The first thing to do is to get a proper diagnosis from a dentist who will soon be able to determine if someone has bruxism. If bruxism is severe, they may wish to take dental x-rays and even a CT scan to show the extent of the damage to the teeth, gums and bone surrounding the teeth, as well as to the jaw joints or temporomandibular joints. Once the condition has been identified then treatment may be multifaceted, as this approach can often be very successful. One simple way to treat bruxism is for a dentist to supply a custom-made night guard or splint which is worn during sleep. There are many different types of night guards that can be supplied. The most straightforward are made from a hard thermoplastic material and fit over the upper teeth, while others are designed to only fit over the front teeth. Stopping the teeth from contacting during sleep will prevent any further damage and might be enough to break this habit. It is possible to buy over-the-counter night guards but these will fit less comfortably. If you choose this option, look for a ‘boil and bite’ night guard that is softened in hot water so it can be adapted to fit a little better. Sufferers may also find it useful to reduce their stress levels and to make sure they get plenty of sleep. It can be helpful to avoid chewing gum and even something as simple as consciously relaxing the facial muscles during the day can be useful. It’s best to avoid alcohol and caffeine as these stimulants can increase the urge to clench and grind. Meditating or practicing yoga, or simply getting into the habit of relaxing before bedtime can be useful in reducing the risk of bruxism. Anyone who thinks they may have bruxism should visit their dentist. Ignoring possible symptoms could badly damage teeth or may even lead to tooth loss. Bruxism can cause considerable damage to any existing restorations, particularly to porcelain crowns, bridges, and veneers and to dental implants. The damage to the jaw joints can also be considerable and in the worst case may require surgery to correct.